Small village stretching from the small beaching-place for poets to the heights of Terra Alta. Main shipbuilding yard in the Azores, using old manual techniques. Place to visit: Church of Santo Amaro. The youngest parish in Pico (1980). Places to visit: Church of Santo Antão and Sitio da Baixa, a characteristic example of the summer sea-side resorts preferred by the inhabitants of Pico. Village situated at the eastern extremity of the island. Interesting vistas of the sea and the inland areas. Lovely, curious park of the Forestry Services. Place to visit: Church of Nosse Senhora da Piedade. Important old port. Typical base for whale hunting, with tug boats and elegant canoes. Place where the first base for hunting the sperm whale was set up in 1876. Place to visit: Church of São Sebastião. 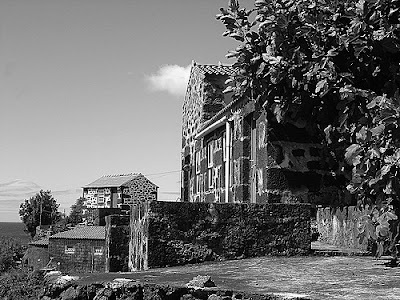 Wineries of Feteira de Baixo, in the picturesque village of Calheta de Nesquim. The houses and garden walls built out of black basalt blocks. A peaceful place in a gentle landscape. One of the first settlements in the island. Fishing port with long traditions and experienced sailors. Worthy of visits are the churches of Santa Cruz and Santa Bárbara (which replace a 17th c. place of worship), as examples of the rural-style religious art of the Azores.